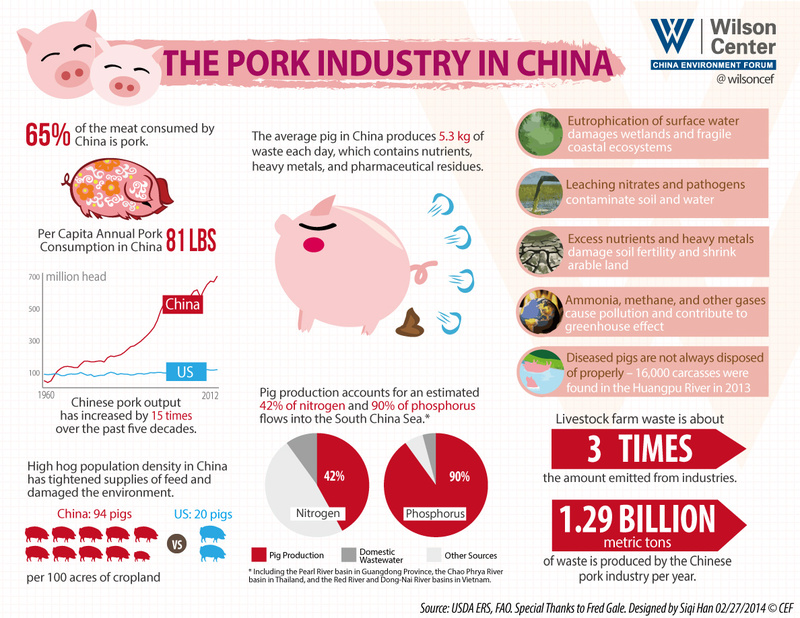 The China Environment Forum’s latest infographic gives a preview of the environmental dynamics at play in China’s pork industry. The upcoming China Environment Series 13 will delve even deeper into the pig production conundrum, and, in conjunction with the Environmental Film Festival in the Nation’s Capital, we will also be screening What’s for Dinner? at the Wilson Center on March 19, which explores the consequences of increasing levels of meat consumption in China. As part of our ongoing effort to bring our research and publications to a wider audience, the China Environment Forum will regularly release infographics on environment, energy, and water issues in China. Stay tuned! Sources: National Bureau of Statistics of China, U.S. Department of Agriculture. Topics: agriculture, Asia, China, China Environment Forum, consumption, development, economics, environment, environmental health, featured, food security, sanitation, U.S.